I had some plain yogurt in my fridge that I needed to use it up, so this recipe was the perfect solution. I wanted to bring at least one loaf into the office, so I doubled everything and made two loaves, then realized I didn’t buy enough lemons and ended up juicing an orange for the glaze, which worked out just fine. Aside from lots of prep work, the recipe was easy, albeit a little strange–I’ve never heard of folding in oil before! 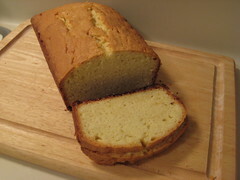 The cake is good–moist, dense, and definitely very pound cake-ish. Flavor-wise, it is tart and sweet and lemony. 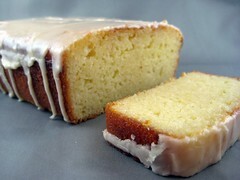 I know people raved about this cake, but I liked Ina’s Lemon Cake recipe more. Of course, that one also has way more fat and calories, but who is keeping track, right? When the cake is done, allow it to cool in the pan for 10 minutes. Carefully place on a baking rack over a sheet pan. While the cake is still warm, pour the lemon-sugar mixture over the cake and allow it to soak in. (I poked holes in the cake then brushed on the mixture.) Cool. Recipe from Food Network/Ina Garten. Passover ends tonight (my family begins eating chametz at lunch–story for another time) and I wanted to bake something with flour! I had some sour cream leftover from the Passover brownies I made and was in the mood to try a new recipe so I flipped through my new cookbook and decided on this pound cake. Speaking of this cookbook, it is a hoot! The author, Judy Bart Kancigor, included photos of family members throughout (including some very cute men–maybe she’ll hook me up!). There’s also an enormous family tree at the beginning so you can see who is related to whom. I love when cookbooks are personalized like that, it’s so much more fun. OK, back to the cakes. Oddly enough, this is the third pound cake I have made that calls for a tube pan–what happened to the days of pound cakes in loaf pans? Or I am just imaging that? Anyway, I still don’t have a tube pan so I substituted two 9″ loaf pans instead and only baked the loaves for about an hour (during which my kitchen smelled ohsogood!). 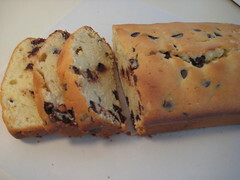 These loaves are buttery, rich, and moist (unlike my previous pound cake disappointment) and the chocolate chips are definitely a nice, sweet addition! I can’t wait to bring these into work tomorrow for my coworkers to enjoy. Preheat oven to 325 F. Grease a 10-inch tube pan with removable bottom, dust it with flour, and tap out the excess. Combine the flour and baking soda in a bowl. Stir well, and set it aside. Cream the butter and sugar with an electric mixer on medium-high speed until light and fluffy, 2 to 3 minutes. Add the eggs, one at a time, beating well and scraping the bowl after each addition. Then beat in the vanilla until smooth. Reduce the speed to low and add the flour mixture in four additions, alternating the with the sour cream in three additions, beginning and ending with the flour. Fold in the chocolate chips. Scrape the batter into the prepared tube pan, and bake on the center oven rack until a cake tester inserted into the center comes out clean, 1 1/4 to 1 1/2 hours. Allow the cake to cool completely in the pan set on a wire rack. Run a knife around the center tube and the sides of the pan, and lift the tube from the outer pan. Gently slide the knife between the bottom of the cake and the pan, and lift the cake off the pan. Cut the cake into slices, and serve. Recipe from Cooking Jewish by Judy Bart Kancigor. I copied this recipe from the food section of the LA Times a couple of months ago and finally got a chance to make it. I had some leftover milk (I never have milk in my house) and a ton of powdered sugar, so I figured why not continue fattening up my coworkers right before Thanksgiving. They’re always up for sweets. This is good. It’s dense, moist, and has a wonderful flavor. And it’s a little after 9:00 a.m. and one of the loaves is already gone. I think it’s safe to say it has the coworker seal of approval. Heat the oven to 325 degrees. Grease and flour a 10-inch tube pan. In a mixing bowl, combine the flour, baking powder and salt and stir with a fork; set aside. Into a small bowl, pour the milk and add the vanilla; set aside. With a mixer, beat the butter at high speed until light and fluffy. Add the brown sugar in three batches, then add all of the white sugar, beating after each addition. Add the eggs one by one, beating well after each addition. Reduce the speed to low and add half of the flour mixture and then half the milk, beating until the flour or milk has disappeared into the batter. Add the rest of the flour and the rest of the milk in the same way. Quickly scrape the batter into the tube pan and bake until the cake is nicely browned at the edges, springs back when lightly touched at the center and a wooden skewer inserted into the center comes out clean, about 1 hour and 10 minutes. Remove the pan from the oven and leave it on a wire rack for 20 to 30 minutes. Loosen the cake from the pan with a table knife and turn it out onto a wire rack or plate, then leave it to cool completely. When cool, glaze with caramel glaze. Add milk and brown sugar, stir to combine. Boil vigorously for 1 minute. Remove from heat and beat in 1/2 cup powdered sugar. Cool slightly then beat in the vanilla and remaining powdered sugar, adding more milk if necessary. Quickly spoon over cake before glaze sets. Cake recipe from the LA Times, August 22, 2007 (sorry, can’t find the link in their archives). Glaze recipe from Cupcake Bakeshop. I don’t own a tube pan, so I used two loaf pans instead. I didn’t have dark brown sugar, so I used golden brown sugar. 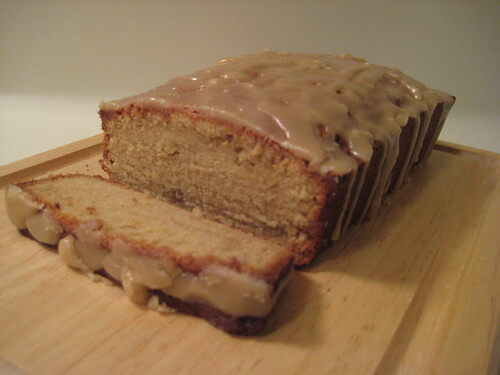 The LA Times recipe included a caramel glaze, but it called for evaporated milk which I did not have in my kitchen, so I searched online for a different glaze recipe.